The first pictures I can recall taking were clicked off on a battered Instamatic sometime early in Junior High, when my class went on a field trip to Washington, DC (my first parent-less trip of more than a few blocks). I shot something like a half-dozen rolls of film, as this was well before the age of digital photography and taking pictures with your smartphone. In fact, it was so far back in time that phones mostly rode the short bus and actually had to be plugged into actual phone lines found in the walls of our homes. We didn’t have flying cars or jet packs yet, either. I took photography classes all through Junior and High School. Eventually, my mom, who was also an avid camera-clicker, installed a darkroom in the upstairs hall closet of our house. This made it hard to find winter coats but easy to knock out a couple of prints after school; well, easy if we didn’t pass out from chemical fumes in the small, unventilated space. In college, I was in the photography lab darkroom sometimes for nine hours a day, perfecting prints, getting a series of shots ready for the photography classes that I had enrolled in so I could use the darkroom, or passing out from chemical fumes in the small, unventilated space. By that time, the passing out part had become a habit. Outside the darkroom, I managed to win most of the photography competitions I entered. Sometimes I got first place, sometimes second, depending on whether my mother had entered the contest, too. It was a rare day when I could best my mother’s eye for framing a shot or choosing just the right subject, light, and angle. Between us, we accumulated a box full of the point-and-shoot pocket cameras that were the usual prizes for these things — which, now that I think about it, is kind of odd, since wouldn’t most photographers entering a contest already, by definition, own a camera or ten? And wouldn’t they want something slightly more upscale than a point-and-shoot, in any case? Also ironic was that I have never seen myself as a photographer. Photography has always been a hobby, something I like to do. In part, this is because I have always had a horrible memory. Photos help me to recall the things I’ve done, the people I’ve seen, and the places I’ve been. But also in part because I enjoyed the feeling of capturing a moment, a striking visual image, a clarification of existence that otherwise might be ephemeral and lost. No, what I wanted to be when I grew up wasn’t a photographer, but a writer. I wanted my stories to fascinate, enthrall, entertain, compel, and do a bunch of other verb-y things, too. I wanted to make sense of the world on the page. Any photography I did along the way was, as far as I was concerned, just to remind me of things I wanted to write about and/or provide a few pictures to go along with my non-fiction pieces (like, y’know, this one. Hmm, better throw in a picture). 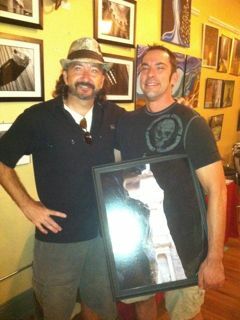 The author (and photographer) with his first photographic art sale. My viewpoint has changed recently. My girlfriend is an artist — a painter — and had been showing her work at a local gallery for a few months when it occurred to me that I ought to stop saying things like, “Y’know, I really outta do something with my photography,” (yes, that’s how most English majors talk, or so I choose to believe) and actually, well, do something with my photography. Sifting through thirty years of photographic accumulation was not the easiest thing to do on a weekend, but I managed to pick a few shots I liked, get them printed up, framed, and then actually accepted for display at the same gallery. The experience of showing my art was, I’ll admit, thrilling. I enjoyed meeting the people who came to the gallery for our downtown’s once-a-month Art Walk; I enjoyed talking with the other artists; and I enjoyed showing my work to an appreciative audience. Even more, I enjoyed selling it to them. Yup, sold my very first piece of ‘artsy’ photography. So now my photography has reached the same level of profitability as my writing. Which one of these pursuits will win in the end? Shall we say ‘Only time will tell’? No, let’s call it a tie. The author is happy to be back writing essays after an absence of several months. You can follow him on Twitter @parablehead or Facebook @C. Patrick’s Motley. His website is goblinbrook.wordpress.com. A new display of his photography will be showing at Canvas in Springfield, MO in October. This entry was posted in Observation Deck and tagged art, Art Walk, darkroom, photography, photography lab. Bookmark the permalink. Yup, you’re likely right. Still, the Washington trip is the one I remember as being my first major photographic expedition, so I’ll go with it (especially since I can’t take it back. Heh). Patrick, you can do both – writing and photography. I love taking pics of old barns and old houses. They’re perfect to use for writing. Easier to describe the things you want when you can look at pictures of them. Great job. Downtown Springfield is like the Bermuda Triangle for me. Hopefully, I can catch your next show. Iv’e always wanted to do a barn collection of the grand old barns before they all get replaced with tinfoil monstrosities. Too, I though that if I ever got ridiculously wealthy, I’d start a program of grants to help restore and save the old barns.